Four months ago, one of our clients bit the bullet with Infusionsoft. In this post, I’ll share why we chose Infusionsoft and what the experience has been like since they becoming a customer. Update: Since publishing this post, my client has moved to ActiveCampaign, who we also use as our CRM / automation tool at Venture Harbour. If you haven’t already considered their tool as an alternative to Infusionsoft, I’d recommend taking a look. So what triggered the decision to migrate to Infusionsoft? Our client had spent months creating auto responder workarounds, in an attempt to streamline their transactional and marketing emails. But they weren’t using the right tool for the job – it was a mess. Their CRM was in Salesforce. Their transactional emails were handled by SendGrid. Their newsletter was in Aweber. You can imagine how much of a nightmare it was getting everything to play along. After weighing up a few other options like Pardot and Ontraport, they decided to give Infusionsoft a shot. It’s been four months since they made that decision. While it’s still early days, I think it’s fair to say that they’re pleased with the software. And it’s certainly made our job of improving the performance of their website a lot easier. Infusionsoft is often compared in reviews to CRM systems like Salesforce, or email marketing services like Aweber. When you do this, it’s no wonder to be surprised at how much Infusionsoft charges. Their software starts at $199/month, although that’s for their basic version with a CRM system and marketing automation. As soon as you want to add in eCommerce functionality and sales automation, you’ll be look at either their $299/month or $379/month packages. On top of this, there is a mandatory kickstarter coaching package, which is a one-off cost of $1,999. We were incredibly reluctant to pay this, and it was the one aspect that almost convinced us away from Infusionsoft. After all, what software charges you to learn how to use their system. More importantly, what software charges you $2,000! This made us think that Infusionsoft must be an incredibly complicated piece of software to cost what is effectively two weeks of the average salary i.e. 80 hours of a person’s time, to educate us (advanced digital marketers) on how to implement and use their software. We were half right. The cost is ludicrous, and the software is complex. But the kickstarter package is extremely valuable. I wasn’t actually present on the kickstarter calls, but after speaking with the client, it was clearly enormously beneficial for them to be walked through how to set things up and have someone that they can ask questions. For us, the $2,000 was also a huge psychological factor. When you pay that much money for a piece of software, you are going to put in the effort to make it work. Given that Infusionsoft has so much potential to transform online businesses, I think there’s a lot of benefit to putting your money on the line as an incentive to make it work. So, there’s no getting around the cost. Infusionsoft is expensive, but only when you look at it in relative terms. As soon as you begin to look at the price tag in terms of ROI, it’s a different picture. The average ROI of email marketing in the US is 44%, which is damn good. Now, add on top of that a CRM system that keeps a record of all of your interactions with customers. On top of that, add an automation platform that automatically keeps in touch with those customers based on their behaviour. I don’t know what the exact average ROI is for Infusionsoft customers, but it doesn’t surprise me that there are so many case studies of people reporting 310% increases in profit, to growing revenue by 832% while tripling their number of vacation days. I don’t think our client has reached these sorts of ROI figures yet, but the impact that Infusionsoft has had on their business has definitely at least paid for itself already. Infusionsoft’s purchasing and setup process could be a lot better, and that’s putting it politely. Unlike virtually every other SAAS (software as a service) company in existence, Infusionsoft doesn’t allow you to sign up to become a customer from their website. Instead, you have to jump through a series of hoops by arranging a demo or calling them up to express your interest. Basically, they want to make sure that you talk to a human being. As someone who likes to do their homework without being badgered by sales people, this is definitely not my idea of an optimal sign up process, but I can see the benefit of doing it this way. Most people will at least have some objections before spending a few grand on a new piece of software for their business, so it makes sense to have a person help them put their objections into context. The initial calls are fine, but just a bit of an inconvenience in my opinion. After the call, you will be able to go ahead and setup your payment, and then it’s time to arrange your first kickstarter session. As mentioned, I was quite apprehensive about my client investing $2,000 to be told how to use a piece of software that was already costing them north of $200/month. But we went for it, as well… we didn’t really have much choice. It turned out to be a great motivator, and it certainly took the load off of my shoulders to figure out the software and then explain it to the client. I also realised that Infusionsoft’s perspective is that it isn’t right for a customer to spend so much money on a piece of software to then have to figure it out themselves. While Infusionsoft could certainly make their software more intuitive, there’s no getting around the fact that a piece of software as powerful as theirs is inherently complex. Don’t confuse complexity with inferior user experience. Their UX isn’t bad, it’s just kind of like trying to design an aircraft cockpit; it’s as simple as something inherently complicated can be. Anyway, InfusionSoft offered two variations of their kickstart package; the Marketing Blueprint Kickstart, and the Automate and Scale Kickstart. Our client went for the latter, which included a series of one-on-one coaching sessions over the first month, as well as a 90-day plan, and help automating a series of the client’s manual processes. The nice thing about these coaching sessions is that it meant that we didn’t have to think too hard about integrating the software with our website, or worry about how all the pieces were going to fit together. While we did do virtually all of the work, it was mostly us being told what to do, which relieved the usual stress of trying to migrate a CRM or payment processing system. Overall, the client was really happy with the initial kickstarter training. While I personally would say that the price is a bit steep, it definitely helps you cement the software into your business. While you’ll begin setting up marketing campaigns in phase 2, you’ll likely want to play around and make adjustments to your campaigns long after the initial kickstarter sessions. So how does automated marketing work? In essence, they’re a combination of email marketing campaigns and landing pages that are triggered by certain actions or behaviours. For example, you might set a campaign that sends an email reminder to customers who have added items to their shopping cart but are yet to complete checkout. Infusionsoft have a pretty awesome library of pre-defined automatic marketing campaigns that you can ‘drag and drop’ into your campaign dashboard – from sending out birthday offers, to re-activating lapsed customers with new offers. Because Infusionsoft is also a CRM system, every customer is positioned along a ‘sequence’. Every time a marketing campaign is sent out to a customer, they are moved along the sequence. This means that at any time, you can look at a customer’s information and see where they are along different marketing sequences that you’ve set up, and what actions they’ve taken on your website. When setting up your campaigns, there’s a lot of flexibility over when and how you send out different campaigns. You can either choose a specific date and time, or choose relative dates, such as ‘X days before their birthday’ or ‘2 months after purchasing their first item’. Finally, all of your landing pages and emails can be designed in HTML/CSS or in a WYSIWYG (what you see is what you get) editor, comparable to services like Mailchimp, Aweber, and GetResponse. From here it’s just much of the same; tweaking, building new campaigns, testing, and increasing your customer database. Now, I want to summarise what we liked and disliked about Infusionsoft after being a customer for about four months. There’s a lot of things that I like about Infusionsoft, but here are some of the things that really stood out for me. Awesome campaign builder – I’m a huge fan of Infusionsoft’s flowchart-style campaign builder. It makes building email campaigns funner than you might imagine, and it’s incredibly satisfying to know that on any given day thousands of customers are all being interacted with in a personalised way, while you focus on more important matters. A great community – From their private Facebook groups to their annual ‘ICON’ conference in Phoenix, Infusionsoft put a lot of effort into getting Infusionsoft users to share ideas and help one another. Good deliverability rates – Compared to other marketing automation providers, Infusionsoft have good email deliverability. The CRM is great – I’ve gone through a lot of CRM systems over the years. Pipedrive, Salesforce, Zoho, and SugarCRM to name a few. I don’t know what it is about them, but I just find them impossibly hard to like. Infusionsoft has been different – their CRM system is actually really good. The thing that I particularly like about it is their lead scoring, which while nothing innovative, I feel they do a much better job at than other CRM platforms. A fast and stable platform – Some of the other automation platforms are notoriously buggy and slow to load. With Infusionsoft, everything seems to load quickly and without any problems. Good customer service – I haven’t actually dealt directly with our account manager at Infusionsoft, but from what i’ve heard from our client, they sound borderline exceptional. They’ve gone to great lengths to ensure that we’ve had a good experience and while all relatively minor issues, they’ve been able to correct everything for us very quickly. It does what it says on the tin – Infusionsoft is massively hyped, and so it’s perfectly normal to be a little bit skeptical when you’re weighing up whether to become a customer or not. Our experience has certainly lived up to expectations, and despite a few glitches and the occasional feature not working as expected, the overall impact on our client’s business has been impressive. In a nutshell, it does exactly what it promises – it gets you to build more systems that allow you to scale your business and focus on more important things. And here are the con’s. While this may seem like a pretty harsh list, they’re all quite minor issues in the grand scheme of things, and even collectively it hasn’t been enough to deter us away from using Infusionsoft. No A/B testing – This is pretty insane. For a service that is so heavily focused around optimising online marketing through emails and landing pages, it’s surprising that Infusionsoft has no formal ability to run split tests. You could of course create two variations of an email or landing page and send each variation out to different segments, but I doubt many small business owners would think to do this.The only workaround is if you already use a service like Visual Website Optimizer or Unbounce, in which case their are ways to integrate the services together, but it seems like it wouldn’t be too difficult for Infusionsoft to simply add some basic split testing functionality. No recurring PayPal payments – Weirdly, Infusionsoft doesn’t enable support for recurring PayPal payments, which was a huge pain for our client who relied on recurring payments for a handful of their subscription products.Conveniently, Infusionsoft have a piece of software called CustomerHub, which we ended up paying for, which does enable membership payments. So, if you want to offer recurring subscriptions, be aware that there’s likely to be an extra cost involved. Great data. Bad reporting – I have a love hate relationship with Infusionsoft’s reporting. On the one hand, the data they display is incredible. There are virtually no vanity metrics, and everything is actionable. However, on the other hand, this data is really badly displayed. Hardly anything is visualised, so you have to constantly crunch the data in your head to come to your own conclusions.To be fair, I would rather have great data that was poorly displayed than have crappy data beautifully displayed, so at least Infusionsoft have their priorities the right way around! It gets expensive – While you will probably start off on their $199 / month package, it’s likely that you’ll eventually end up on their $379 / month package. This is a good thing, as it means that your business must be growing, which is the whole purpose of investing in a piece of software like this. Just be aware that Infusionsoft works on the basis that they grow their business as you grow yours. They offer a myriad of optional extras and pricing tiers, which will become increasingly compelling over time. Mediocre email templates – This may be because i’m used to GetResponse, who have really slick email templates, but Infusionsoft’s email designs are pretty average. It’s not a huge deal, but it wouldn’t hurt for them to get a designer in to spruce these up a little. The kickstarter package – As emphasised throughout this post, there’s something that just doesn’t sit well with me in the current structure they have with the mandatory training system. While it was extremely valuable, it just doesn’t feel right to charge a customer two grand to learn how to use a piece of software. I’m hoping that in time Infusionsoft will either eliminate / reduce this cost, or offer a ‘pay per consultation’ model that allows more experienced customers to pay for less sessions than those who need more hand holding. With a piece of software like Infusionsoft it’s hard to give a plain answer as to whether I would or wouldn’t recommend it, because so much depends on the context of your business’ situation. In our case, the client’s needs and our ROI calculation tipped the needle in favour of Infusionsoft. That said, none of my other clients use Infusionsoft, and I can’t see myself using Infusionsoft for Venture Harbour any time soon. It just wouldn’t be a good fit us based on how we grow our business. So, that brings us to an interesting question – who is Infusionsoft right for, and who is it not right for? Who is Infusionsoft for (and who isn’t it for)? Infusionsoft isn’t for everyone. For most clients I usually recommend just using GetResponse for their email marketing, Unbounce for their landing pages, and Salesforce as their CRM system. However, that’s because we work with a lot of new startups and companies that offer bricks and mortar services. Infusionsoft doesn’t really work for those types of businesses. In my opinion, and based on who i’ve heard love and loathe Infusionsoft, I’d say that Infusionsoft is for businesses that are already turning over at least $150,000 per year from selling products online. That’s because the magic with Infusionsoft lies in the integration between the CRM, eCommerce system, and marketing automation. 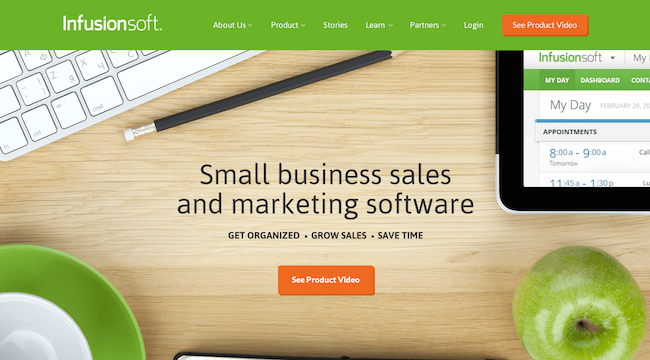 You’d be silly to buy Infusionsoft just for their CRM, or just to sell products online. But when you combine all of those things in one, you can do some really smart things. Same question here… after one year, how’s the Infusionsoft experience going? – Infusionsoft is going well for this client. They are still using it and have reached a nice tipping point where the sequences are generating good results. On a personal level, I’ve found myself turning to ActiveCampaign over Infusionsoft a lot more for new projects. Their campaign builder is *really* nice and it’s about 1/20th of the cost. It’s definitely not as extensive as Infusionsoft, but for basic to semi-advanced marketing automation it does the trick. For several days now I’ve been pondering if Infusionsoft is the right fit for my start up ‘RewardVape…today ‘Black Friday’ I have come perilously close to spending some of our budgets on something that we will aim to buy when we are a success and have both the turnover and customer base to justify it. I really am grateful for this review…so, guys and girls of VentureHarbour you have made my day! What you don’t like about Infusionsoft lines up pretty well with what I’d say too. The reporting is terrible and the fact that you can’t split test is actually really sad for a world-class marketing tool. Warning: Do Not Join The Kickstarter Program Under Any Circumstances. Infusionsoft by itself is decent but any package where they promote “Do it For You” is just a waste of money. I should have done a little more research before I signed up for Infusionsoft Kickstarter but I was told that all my campaigns would be set up for me for $3,000. It was high but I figured that time is money and money is time so let’s spend extra to get everything set up right from the beginning and learn the program as I go. What was set up for me were basic campaigns that did not work. They do a rush job of setting up basic campaigns and then leave you on an island without any support. You have to figure everything out by yourself, which I am used to doing, so after the “Kickstarter Program” is complete, you are wondering what you just paid for. Anyway, enough with the rant. I would rate the Infusionsoft Software at a -B. Good e-mail marketing software but do not let them sell you on anything more. Whatever the salesperson on the phone says, however he presents it, just say no. Get the lowest package you need , watch the videos, and build your own campaign. thanks for this. i’m just looking into my first CRM and a counterpart recommended infusionsoft. it seems expensive, but i’m researching options. loved your article. Thanks for the review. This is incredibly helpful. Interestingly, I’ve actually been in the process of choosing between Infusionsoft and Active Campaign for the last couple months and I would like to make a decision soon. Both are within my budget. I’m trying to scale our business with as few resources as possible and don’t want to increase the administrative burden. One thing that concerns me regarding Infusionsoft is that it is harder to manage and might require more hands on work than Active Campaign. At the same time, it seems to me that Active Campaign’s CRM features are a bit light. For example, I have three different products and want to investigate and market to customers for cross-selling opportunities between them. 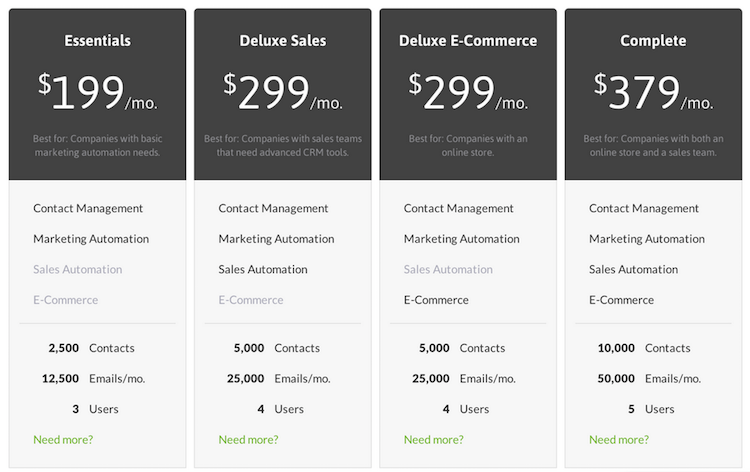 It seems to me that Infusionsoft, despite the higher cost, would be a better solution for the cross-selling, especially given the robust-ness of the CRM. 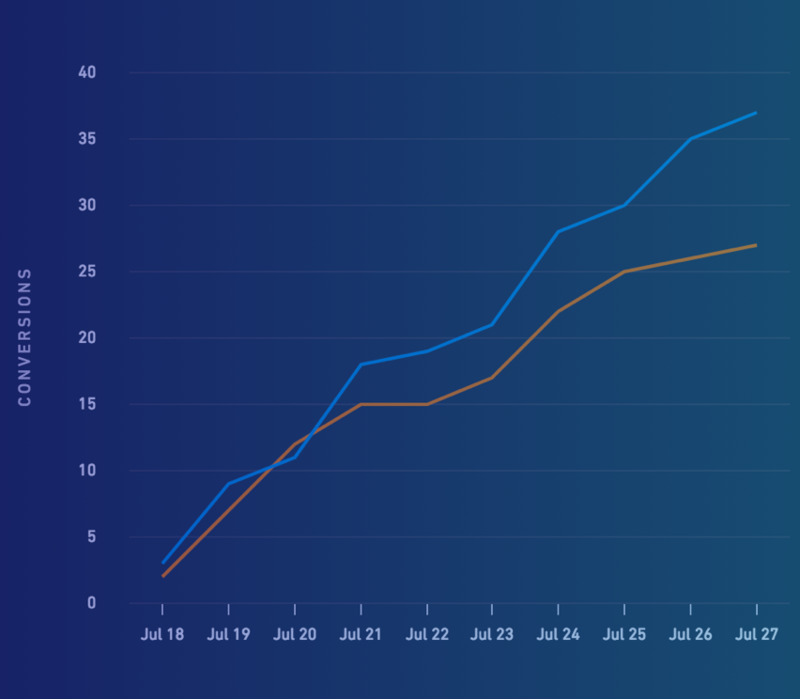 However, I can’t get over the far better pricing and scalable platform from Active Campaign. Couldn’t have been a better review! Great Post..